I've lived in the Phoenix, Arizona area for a long time, and I've seen a lot of cats. And not just on the internet, but also in IRL (In Real Life). Where I live now, a few blocks from the Sahuaro Ranch, the feral cats wander around the neighborhood, especially in the wee hours of the morning. When I lived in Tempe, back in my ASU days, I had never seen so many cats wandering around all of the time (I grew up in Minnesota and I guess they can't live outside there in the winter). So, as you can tell, today I'm thinking about cats in old-time Phoenix. 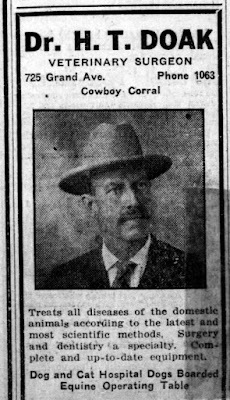 I wish I had a pic of some cats in old-time Phoenix, but the closest I can come to that is this ad for Dr. H.T. 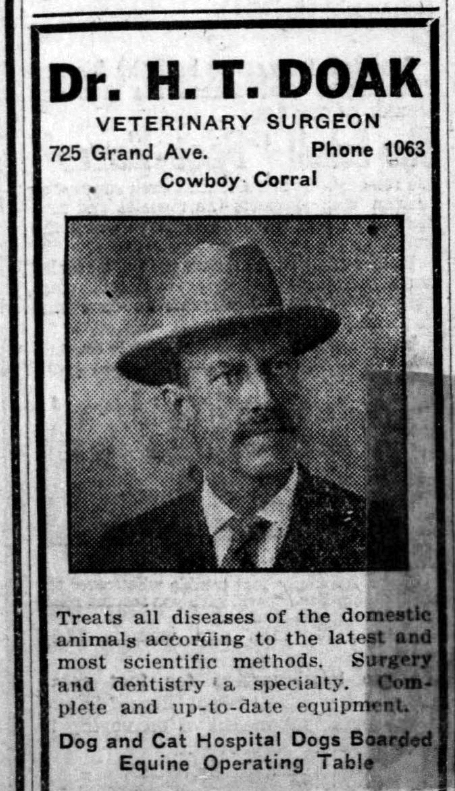 Doak, Veterinary Surgeon in 1918. Looks like he took care of domestic animals (he probably didn't treat farm animals, which would have been much more common in those days), and I find it interesting that horses (equine) were considered domestic animals back then. Makes sense, although I don't see a lot of horses in my neighborhood nowadays. I see that he had a dog and cat hospital, but if I'm reading the ad correctly, he only boarded dogs, not cats. His place of business was located way out on the edge of town, at 7th Avenue and Grand, at what was then called the Cowboy Corral (northeast corner of 7th Avenue and Van Buren, at Five Points). Actually, since he was north of Van Buren, he was outside of the City Limits. It looks like he had all the latest up-to-date equipment, include a phone, the number being 1063. I would imagine back then that Dr. Doak would make a house call if you had a very sick cat, because most doctors did, even doctors for humans, back then. In fact, it's only been in the last sixty years or so that doctors have stopped making house calls. I've never seen a doctor do a house call, but they did before my day. I wish I could tell you more about cats in old-time Phoenix, other than the fact that they were there, and, just like today, were either well cared for, or wandering around doing the best they could.